Posted in Reviews on October 18th, 2011. 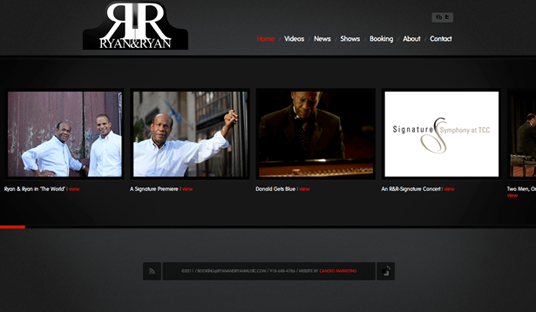 The dynamic Ryan & Ryan concert piano duo needed some help with a new website and spruced up look. Barron & Don Ryan are a father and son performance act—blending jazz, classical, pop and ragtime with a fun, entertaining experience, death defying feats, shaker egg tosses, all while tickling the ivory keys! They truly are fun and spectacular. We spruced up the Ryan & Ryan brand with a logo re-design and built their website allowing them to showcase their video content as well as their regular vlogs (video blogs) that they self-produce. It really is a snazzy, new classic, and professional website. Get the full website experience here.